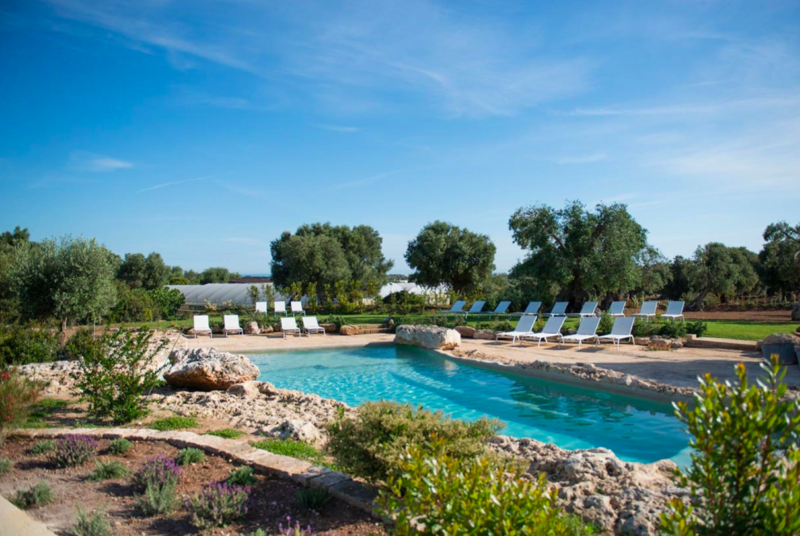 Picture yourself arriving at what used to be a rustic farm in the countryside and casting your eyes upon beautifully manicured gardens, effortlessly chic decor and an absolutely stunning natural style pool built into the rocks. 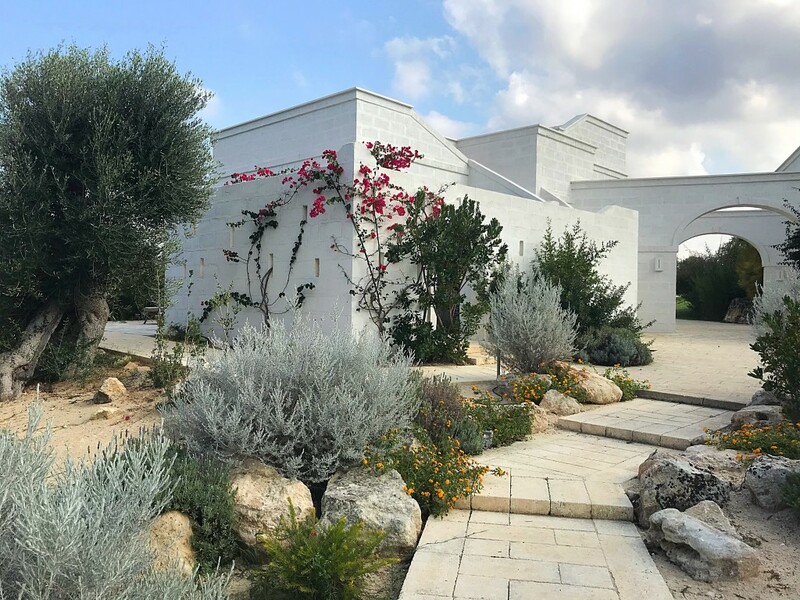 Yes, that’s just a taste of what it’s like to enjoy the grounds of Masseria San Francesco. It’s only about a 40-minute drive from Bari airport, so it’s the perfect stop over before moving on to explore the rest of the region. Enjoy a splash of luxury and settle into the slow pace of life here. 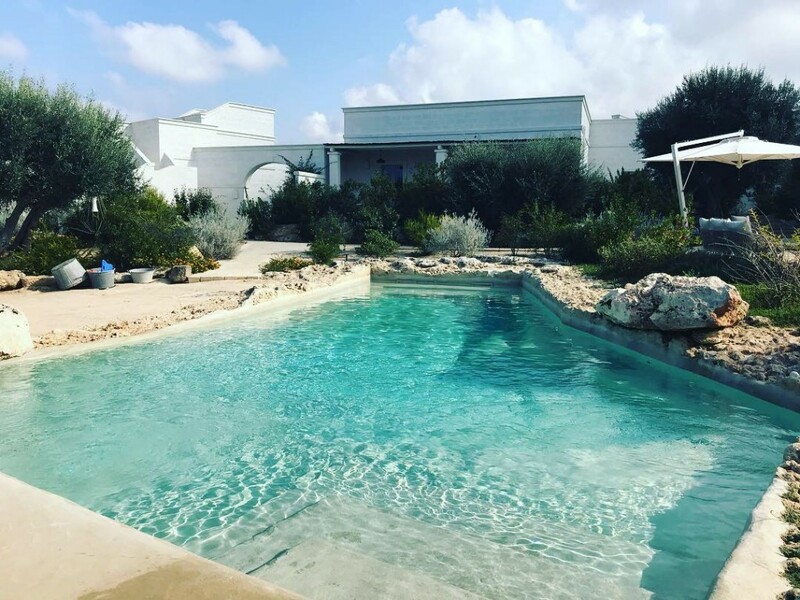 We stayed at this Masseria for the first night of our honeymoon, and it certainly got our romantic break off to a luxurious start. We had a spa bathroom with a terrace outside looking over the gardens. 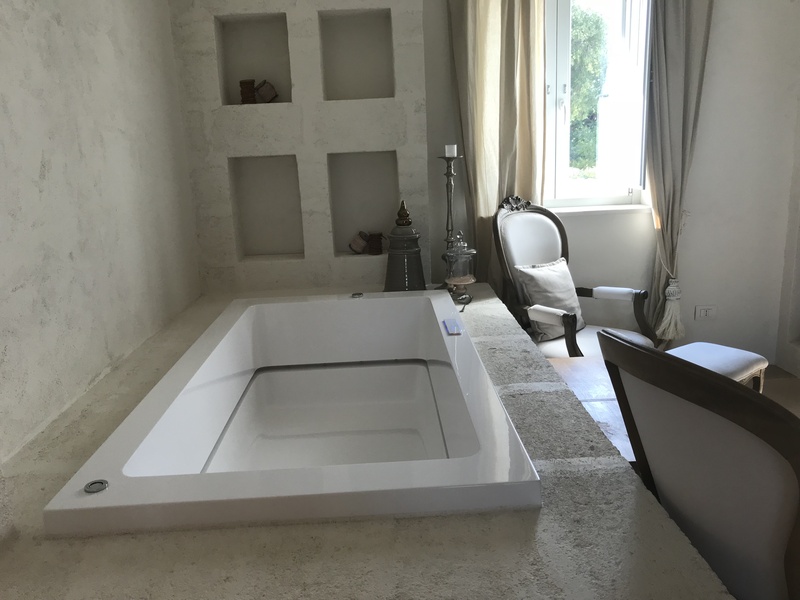 The bath had soothing mood lighting and the decor in the room was modern and fresh. From the moment we arrived we were taken care of and personally shown around our room. I can honestly say I think I had the best night’s sleep of the entire trip at this place because the bed was absolutely heavenly. It was so nice to pass out on such a comfy bed after our flight. 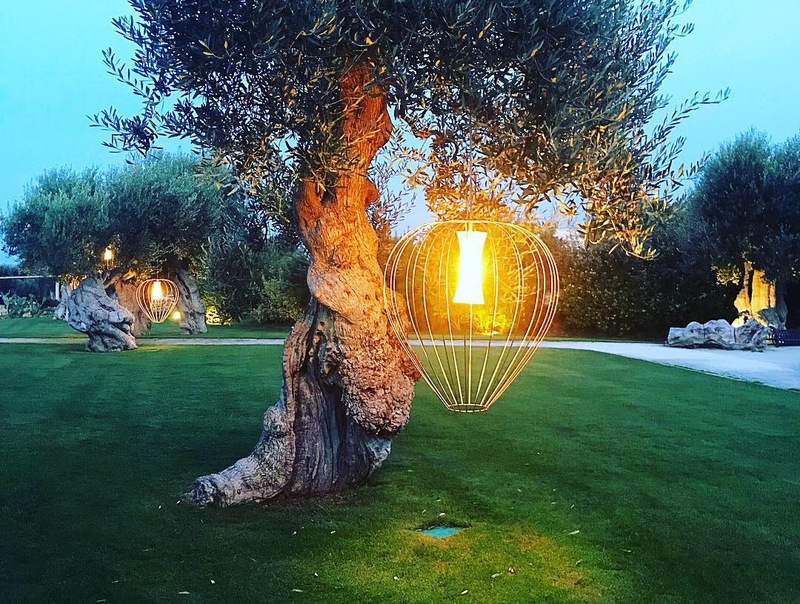 The gardens were filled with picture-perfect olive trees and enormous lanterns which looked absolutely magical at night. And the foliage around the buildings added some vibrancy and natural beauty to the hotel. I particularly loved the pretty pink flowers climbing up the walls of the building around the pool. We had such a chilled out time indulging in some treats by the pool. 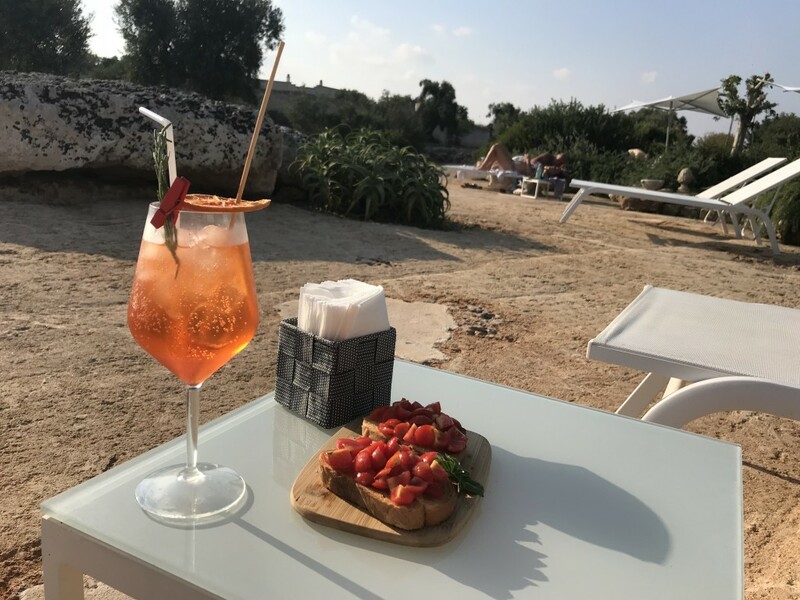 I obviously had to kick off our holiday by sipping on an Aperol Spritz and some bruschetta whilst sunbathing on an oh so comfy sunbed. The next day I also ordered some pasta for lunch and it was so tasty – much nicer than some of the pasta we had at several restaurants around the region. The pool was the perfect temperature. Cold enough to cool you off, but not so chilly that you can only dip your feet in. It had a little waterfall feature which was great for taking a few Instagram snaps, and of course, the constant sound of trickling water is uber calming. 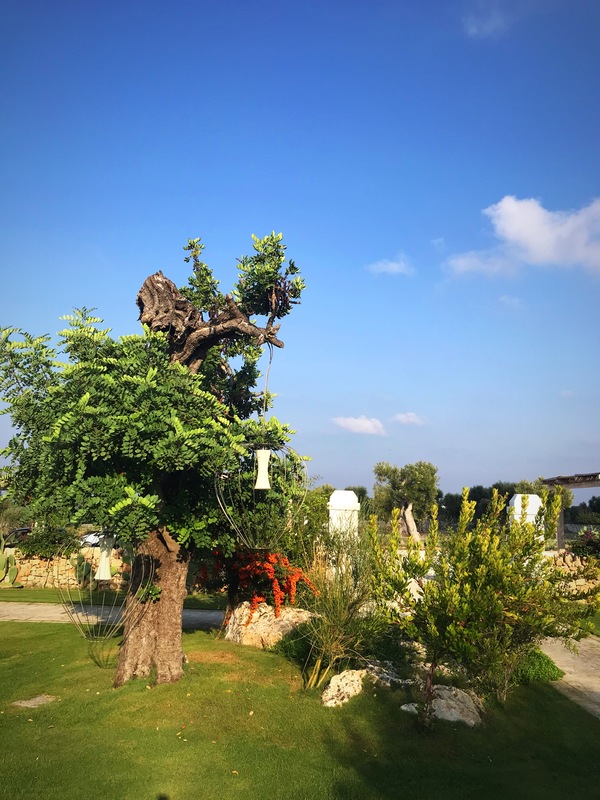 We were surprised to stumble upon a TRX training aid tied to a tree in the garden. So we were able to squeeze in a little workout. We got a few stares from the people chilling by the pool whilst we were doing press ups, single leg squats and shuttle runs around the garden. There’s also a little golf course where you can work on your swing if you wish – but golf really isn’t my thing. Possibly one of the best things about this hotel is the breakfasts. I mean, wow. You’ll be in food heaven, especially if you have a soft spot for super sweet treats. 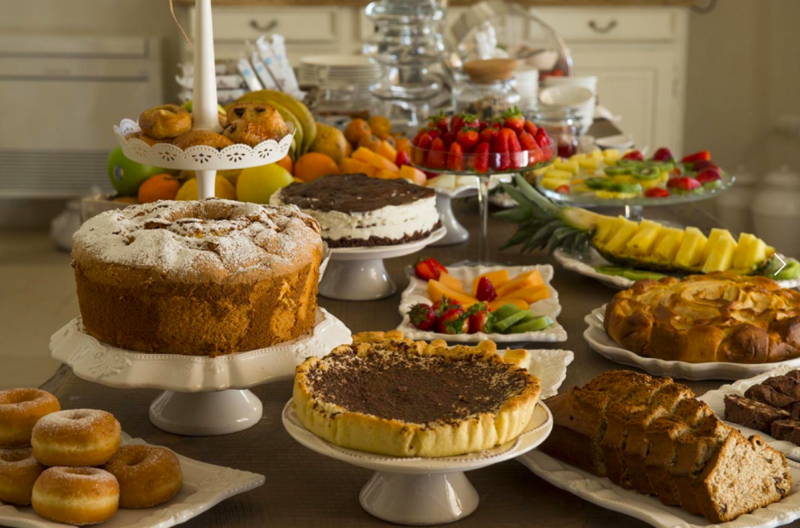 It seems the Italians in this region like to eat sweet cakes and pastries for breakfast. I’m not even a sweet person myself (savoury all the way) but I was impressed. The spread they put out for breakfast looked beautiful and extremely indulgent. They also served focaccia bread and two different types of mozzarella which was sooo tasty. 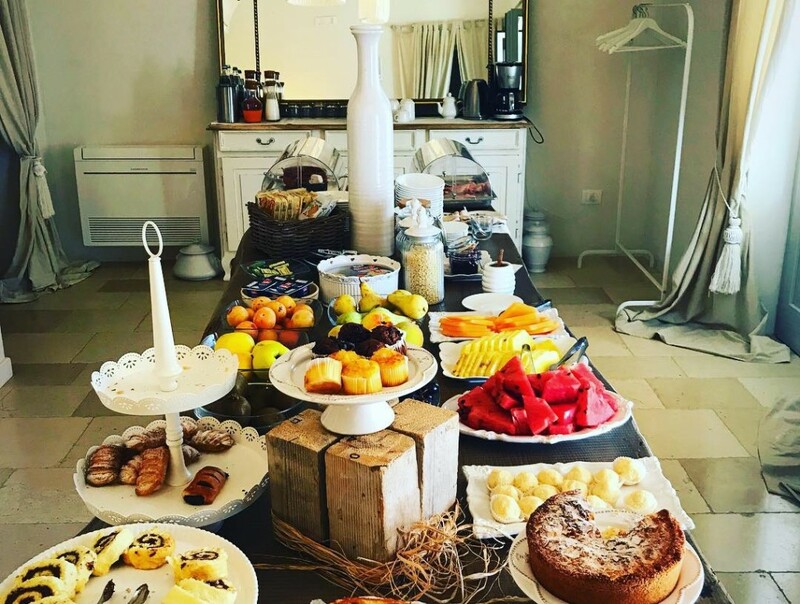 You can see in the pictures just how yummy this breakfast looks. 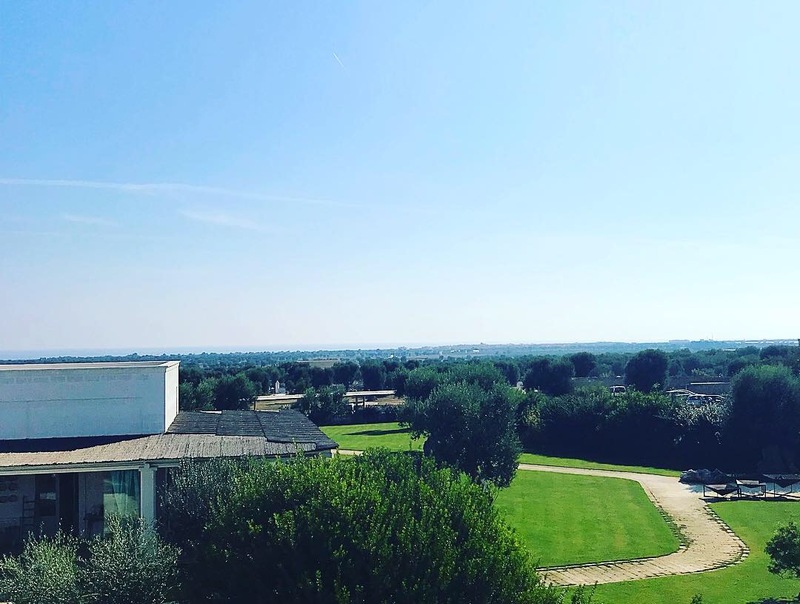 The only downside to this place is it is in the middle of the countryside and you have to drive to local restaurants and shops etc. Though there is quite a nice town about ten minutes away. But all in all a lovely stay. 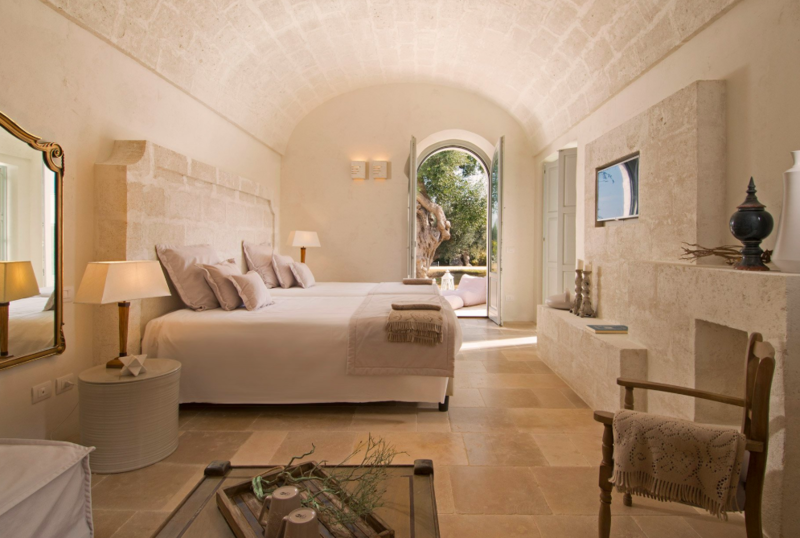 This is a fabulous place to enjoy a few days of relaxation in plush, chic surroundings. 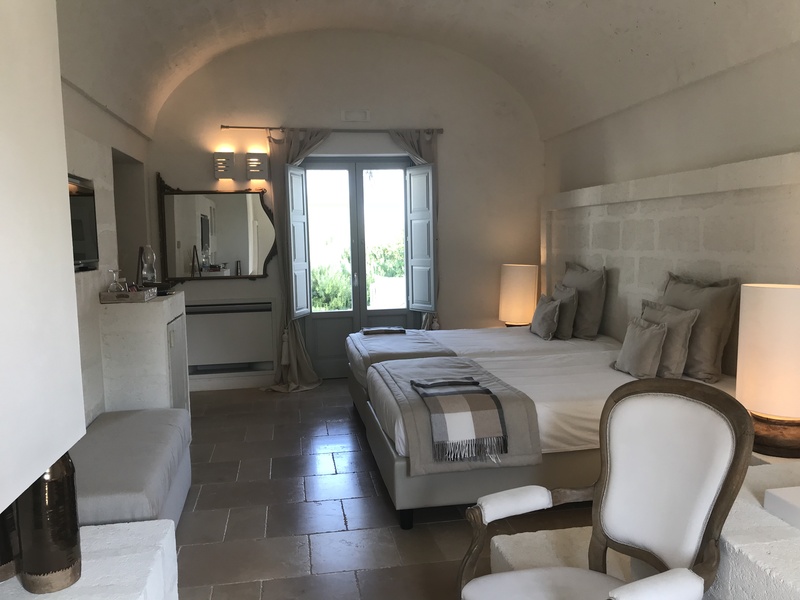 Thank you Masseria San Francesco for a wonderful stay. 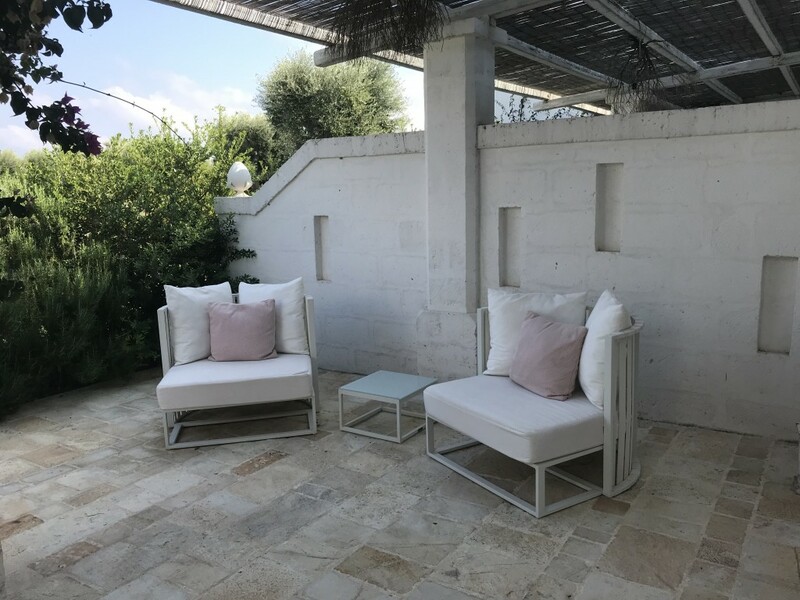 If you’d like to see what else we got up to on our Puglia honeymoon, check out the video below and this blog post.